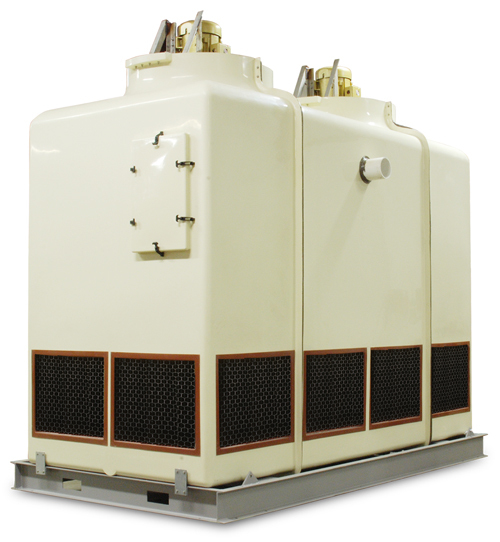 Evaporative cooling towers, like the ADVANTAGE Power Tower® Series, provide cooling by evaporating a small amount of the recirculated process water flow. Approximately 1,000 BTU’s are required to evaporate .12 gallons of water. Therefore, every tower ton (15,000 BTU/hr) requires approximately 1.8 gallons of water evaporation, or .03 gpm/ton. As water evaporates in a cooling tower system, the water vapor enters the atmosphere while any dissolved solids remain behind, building concentration in the remaining water. Most water treatment systems control this concentration by bleeding off the high concentration water, which is made up by fresh city water with a lower solid concentration. The amount of water that is bled off by the water treatment system is usually less than or equal to the amount of water that evaporates. Therefore, the maximum normal water makeup for a cooling tower system is .06 gpm / ton, or about 2% of the nominal tower flow rate. The following chart specifies the Maximun Water Make Up requirement per model. For more information about water make-up requirements and cooling tower systems call the Advantage Sales Department at 317-887-0729. Would you like to Download FYI #262 to your browser?